For more than 60 years, millions have peered up at this gentle giant at the State Fair of Texas and heard his distinctive welcoming voice. 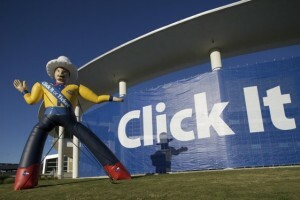 Now Big Tex has a new message for Texans: Click it or ticket. Beginning May 3, a 20-foot replica of one of the state’s most famous citizens is traveling to Texas cities to encourage motorists to buckle up. Big Tex’s road trip is part of the Texas Department of Transportation’s 9th annual Click It or Ticket spring campaign that warns drivers and passengers to fasten their safety belts or expect to get a ticket.